A common category of software you will find on many Windows PCs are system optimizers and cleaners. One such application is CCleaner, a powerful and popular Windows PC cleaner which scans for and deletes unwanted files, private information such as browsing cache and history, freeing up space and guarding your privacy and more. Unfortunately, there is no CCleaner release for Linux systems, so if you were using it on Windows and made a switch to Ubuntu Linux (one of the recommended distros for Linux beginners), you are probably wondering which software to use for the same purpose on your new platform. Whether you have just made the switch or you have been using Ubuntu before, if you are looking for an alternative to CCleaner, you have landed in the right place. In this article, we will share 6 best CCleaner alternatives for Ubuntu Linux. BleachBit is a free open source, powerful, feature-rich, and cross-platform software to easily and quickly clean your system, free up disk space and protect your privacy. It runs on Linux systems and Windows. It’s easy to use, and it supports up to 65 languages around the world. It helps clean your system thus freeing up disk space, reducing the time it takes to create backups, and improving overall system performance. It also assists you to maintain privacy by shredding files (any type of file) to securely hide their contents and prevent data recovery, and overwrites free disk space to securely hide previously deleted files. Importantly, it comes with a command-line interface for those who enjoy working from a terminal, it’s therefore scriptable and also allows you to create your own cleaners via CleanerML, and many other features. To install BleachBit on your Ubuntu and its derivatives, use the APT package manager as shown. 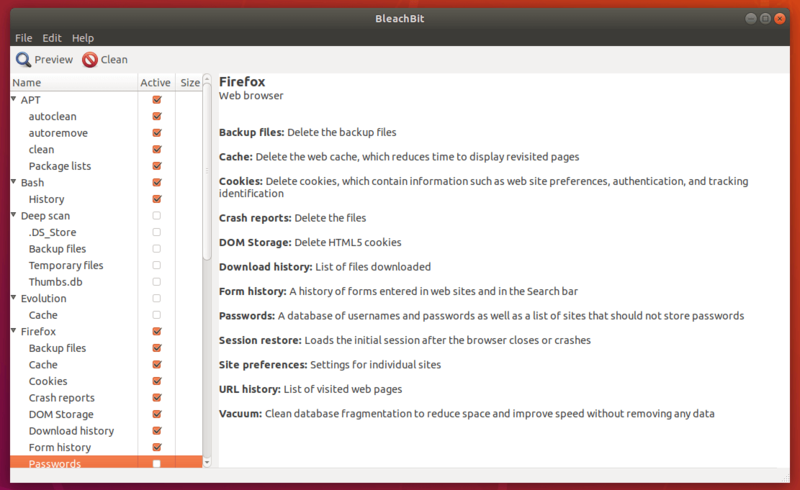 The version of BleachBit in the repositories of many Linux distributions is often stale, so to use the latest version, use the .deb or .rpm package for the most similar Linux distribution at the BleachBit Download page. 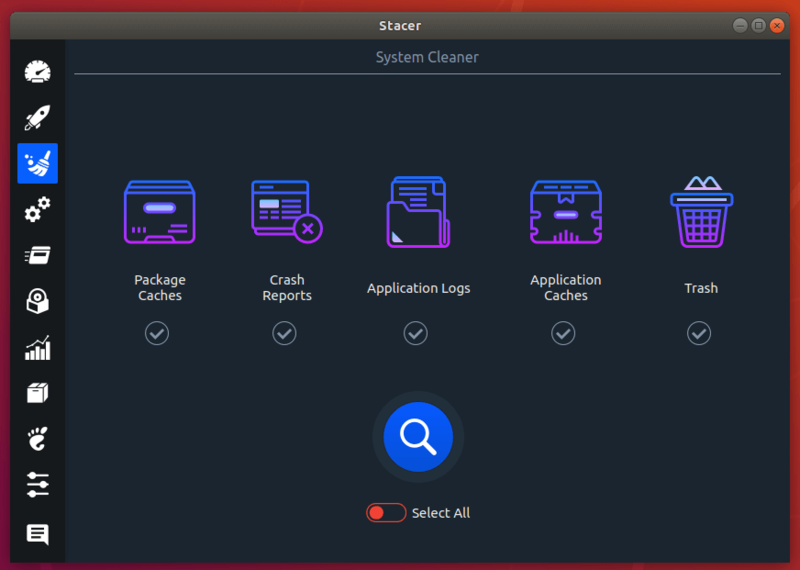 Stacer is a free, open source system optimizer and monitoring tool for Linux systems, with an elegant and intuitive GUI. It comes with useful features you would expect from a system optimizer, and a real-time system resource monitor, such as a system cleaner. Its beautifully designed dashboard gives you access to a wealth of system information; allows you to clear app caches, analyze system start-up, start/stop system services, and more so uninstall applications. In addition, it seamlessly adapts to your pre-configured system look and feel. To install Stacer on your Ubuntu and its derivatives, use the following official PPA to install it as shown. For other Linux distributions, head over to installation instructions at https://github.com/oguzhaninan/Stacer. FSlint is a free open source, simple and easy-to-use application for finding and cleaning various kinds of lint on a Linux filesystem. 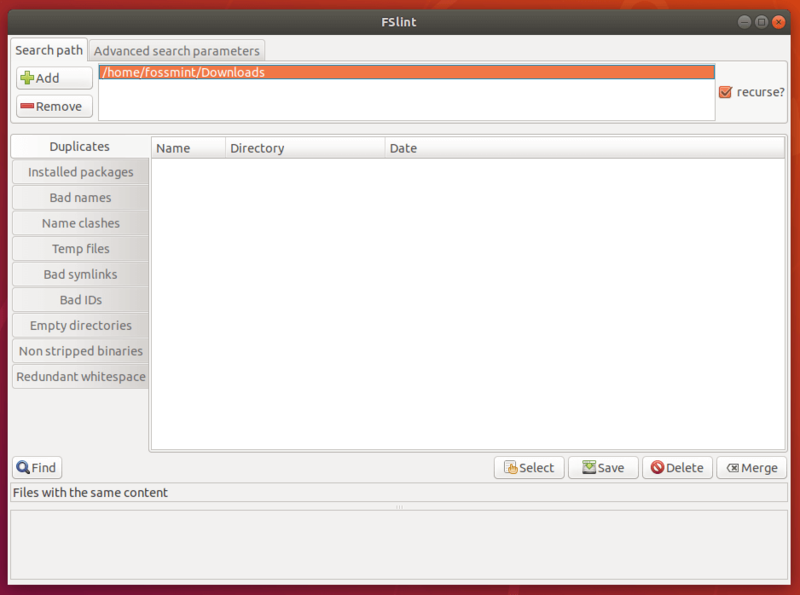 It has both a GTK+ GUI and a command line interface allowing you to automate certain operations via scripts. It helps to remove/delete duplicate files in Linux, find and delete empty directories, unused temporary files, unwanted and problematic cruft in files and file names, bad symlinks, thus keeping your system clean. After performing all the above operations, you will regain disk space that was being hogged by unnecessary and unwanted files residing on your filesystem. To install FSlint on your Linux systems, use the appropriate package manager to install it as shown. Sweeper is a simple and the default system cleaner for KDE. It is used to clean unwanted traces of user activity on a system to protect your privacy, and reclaim disk space by removing unused temporary files. It can delete web-related traces such as cookies, history, cache; image thumbnails cache, and also cleans the applications and documents history. To install Sweeper system cleaner on your Linux systems, use the appropriate package manager to install it as shown. 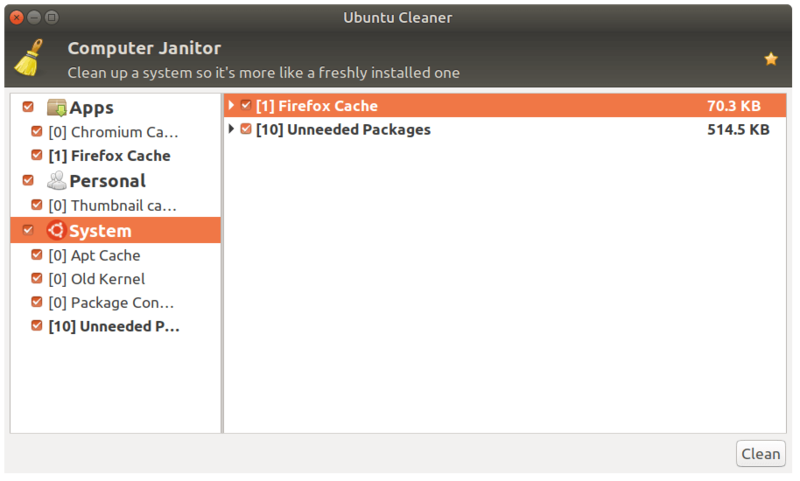 Ubuntu Cleaner is also a free open source, simple, easy-to-use Ubuntu system cleaner. It frees up disk space and gets rid of all private information from your system such as browser cache. It also removes: APT cache, thumbnail cache, unused packages, old kernels as well as old installers. This way, it keeps your system clean and helps you regain some disk space. To install Ubuntu Cleaner on your Ubuntu and its derivatives, use the following PPA to install it as shown. GCleaner is a free open source, intuitive, simple and fast system cleaner for Ubuntu Linux and its derivatives. Its a port of CCleaner developed using Vala, GTK+, Granite and Glib/GIO. Like all the above system cleaners, it protects your privacy and makes your computer faster and more secure to use. To install GCleaner on your Ubuntu and its derivatives, use the following PPA to install it as shown. Note that you can also check out Ubuntu Tweak Tool, however, the project is no longer actively maintained–install and use it at your own risk. That’s all! In this article, we have shared 6 best CCleaner alternatives for Ubuntu Linux. If we have missed any software you know should be in this list, let us know via the comment form below. Thanks for sharing the best CCleaner alternative for Ubuntu. I think Sweeper is a great alternative since it has a similar interface like CCleaner.